I met Goya and Velázquez, at El Prado Museum in Madrid. I went with my parents and my brother. We spent there several hours several days to contemplate the wonders of the museum with calm and avoid getting too tired. I enjoyed a lot the rooms filled with paintings by those two giants of art. I love portraits and there were a lot of them because both were court painters. Velázquez in the XVII Century and Goya later, in the Romantic era. You could see beautiful dresses, queens and princesses, kings and knights, and court characters. I liked Goya a lot. His way of painting, his colors, his characters. But suddenly, his lasts works grew darker and darker. First the “Disasters of War”, then his “Black Paintings”. That scared me a lot, above all the famous “Saturn devouring his son”. 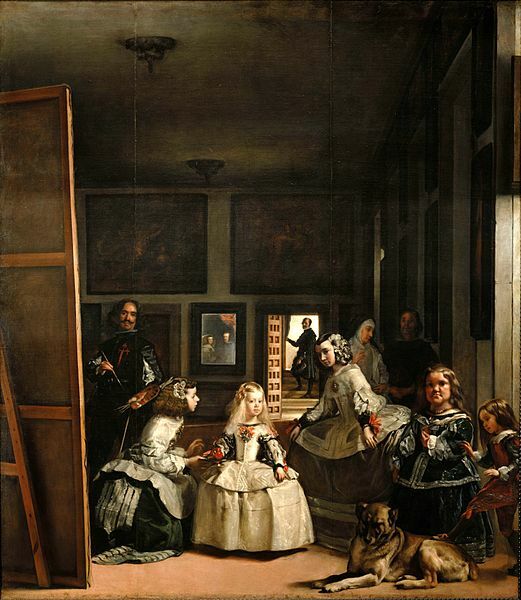 So when we arrived to the room where you can see the famous painting “Las Meninas” by Velázquez, I was happy again and my fears disappeared. I was contemplating a painting with a princess and girls with beautiful dresses and a great sense of deepness and reality. We went back home and one year after I get sick with a bone tumor in my leg and I needed an operation. I was twelve and I was very worried about the anesthesia, because they told me that when you are recovering from anesthesia you say everything, even your deepest secrets, and at that age I didn’t want anybody to know about my secrets. And that was my secret. My father told me later he was proud of me I had a cultural delirium. Daily Prompt: The Artist’s Eye. WP DP:” I love them all because of who they are” | ACT. REACT. or just THINK about it! How surreal for your anesthesia experience. You should write a short story about it. I would read it. It was. I remember every detail as it happened yesterday. Reblogged this on From Five to Fifty.